4pm - It's kinda late for me to be making a 1st Blog post. Sorry about that! 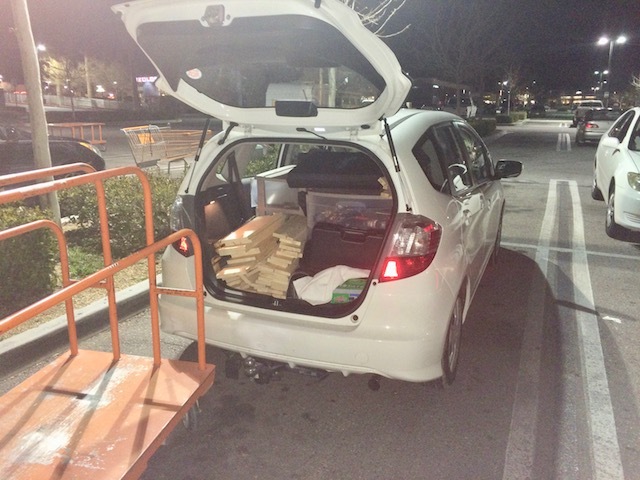 Yesterday evening, at Home Depot, most of the material for Honda's Storage Cabinet was obtained. Took about three hours to do it! I had with me a material take-off list. But as it often is with such a list, there are always revisions. These revisions could be from errors. Or, in this case, revisions from design changes. 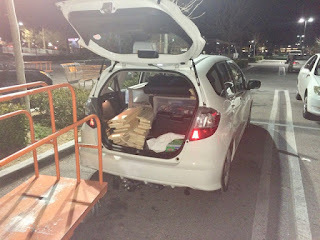 But when I loaded up Little Honda with all the purchased stuff, we had almost everything to complete the entire project! 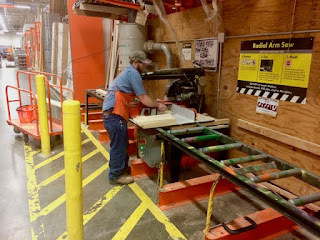 Home Depot saws to dimension! I am not familiar with other hardware outfits. I like Home Depot because they have come up with a formula for customers that works. For me, that formula works great! 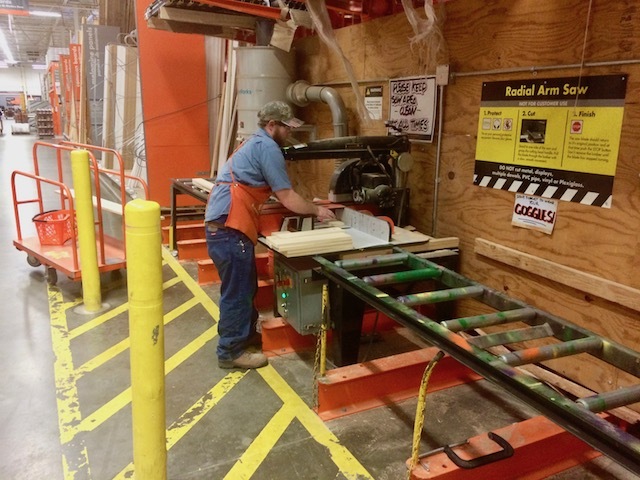 Home Depot saws to dimension lumber boards and plywood boards that customers purchase. For a project as my storage cabinets, it means that all I have to do is assemble the parts. Home Depoat stocks small quantities. They did not always stock onesie quantities. And they lost a lot of business to competitors such as Ace and Orchard Supply hardware stores. However, Home Depot recognized their error and now sells in these small quantities! This is a cabinet shop located in the eastern end of the City of Apple Valley, California. The shop has a worldwide reputation for fine workmanship and innovation. Owner, manager and the driving force behind the immense success of the shop is the famous, MsTwayler. A pair of Sears plastic saw horses. 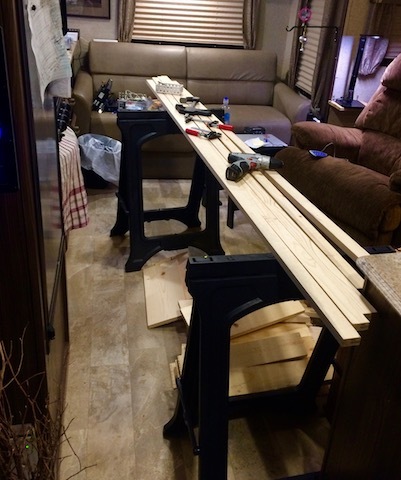 Three uncomplicated, simple to use clamps. Craftsman battery powered special extremely heavy duty drill motor. PrimeGuard exterior grade screws. 1-1/4" in length. Specially designed and produced for the Little Honda Storage project. With a strange grey colored coating. George, I have a question about your new ability to stop eating once you don't feel hungry. When you do that, doesn't it make you hungry again sooner? For example, if I have eaten only half my supper and realize I'm not hungry anymore, I could stop eating. But then I might feel hungry again at bedtime, which isn't a good time to eat (I don't think it's healthy to lay down when one has just recently eaten). Does this happen to you? Do you eat again when you become hungry at non-mealtime? Or are you able to sleep while you are hungry? Thanks for helping me to understand as I try to figure out my own version of eating better. What I'm doing sounds too easy, doesn't it. How am I able to turn away from food, simply because I'm not hungry anymore? * At bedtime, you eat something because you now are hungry. * You eat that something until you do not feel hungry anymore. * Now you are able to sleep, because you went to bed without being hungry. A: I only eat when I am hungry. And stop eating when I am not hungry. Stop eating when you are no longer hungry. Doing that, should stop you from OVER EATING. That's it! There is nothing else. OVER EATING is the culprit here! There is a restaurant that I love. Their food is sooooo delicious. It's "China Super Buffet", near my past home in La Mesa, CA. * One bowl of their soup. * One plate of my favorites. Only one layer of food. My plate is not stacked up to over-flowing. If I want more because I remain hungry, I eat a little more. When I am no longer hungry, I stop eating. Sue, the trick is to be sensitive to when you are no longer hungry. At that point, stop eating. Thank you, George. But you know, you didn't really answer my question. I understand about stopping when no longer hungry. What I'm curious about is then becoming hungry again earlier than before (perhaps more than 3 times per day). During the day, it might work for me to simply eat when I am hungry (and *only* then, of course) even if that is more than 3 times per day. But I find much value in keeping to a regular schedule when I eat, so this is a change I would have to choose carefully as it could have other undesirable impacts. Also, as I mentioned, it is not healthy for me (and many others) to eat within a few hours of bedtime. Fortunately, it doesn't usually disturb my sleep to feel hunger at night, but I know that's not true for all people. I was just curious how you dealt with this issue. It sounds like it's not a problem for you. And, why do you throw out food when you stop eating partway through a meal -- why don't you simply save that food until your next meal? Comment is not the right format for this. Very kind of you to offer suggestions to Reader Sue, about food/eating. I have recently went through a succesful odyssey myself. In my case it involved eliminating almost all carbs. It is working for me but the one thing the experience proved is that each person is different and the tytpical nutrition rules, guidelines.... proported in the media and elseware are not necessarily true. The old food pyramide is not good for everyone... Anyway great project. Home Depot is great for custome cutting.... I often think about working there in after my regular career is over from retirement... Great project. Custome cabinets are great. You can spend a life time customizing your stuff. I hope to due just that in retirement... Great job Gershon!!!!! !